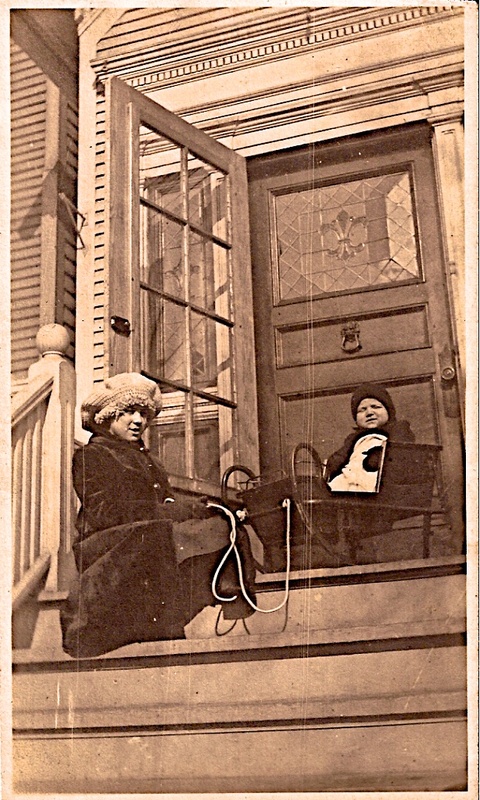 If you’re a frequent AH visitor, you know we love old photographs, particularly when they include a house or building still around today, a vintage street scene that transports us back in time, or maybe a neighborhood mystery that needs solving. Here’s an amazing photo you might think was taken in rural Oregon, maybe in the thick Douglas-fir forest up near Mt. Hood. Have a good look at the picture before you scroll down to see exactly where it’s from (click on the image for a very sharp and enlarged version). Ready for its actual location: Northeast 40th and Failing, looking northwest. Seriously. Here’s the same view today. This is the first of a series of photographs we’re going to roll out over the next few posts, showing the very early days of the Beaumont-Wilshire neighborhood, dating back to the 1920s. Life-long resident Paul Kirkland sought us out after learning of our passion for old photos and wanted to make sure his photos had a good digital home and were appreciated. Thank you Paul, and no problem there. We were thrilled to see these photos, which are about as close as possible to time travel. The common denominator in these images that we’ll roll out in the next few weeks is Paul’s grandmother, Bessie Kramer, who lived in the neighborhood and ran Beaumont Dry Goods and Book Shelf store at the corner of NE 43rd and Fremont. Bessie Bartos Kramer Weber was born in Iowa in 1894 and first appears in the Oregon record in the 1920 federal census with her husband Jessie and infant daughter Maxine. 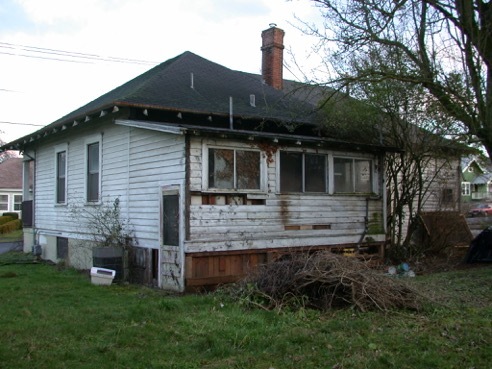 In the 1920s and 1930s, she lived in the neighborhood in several locations both as a boarder and then a renter. 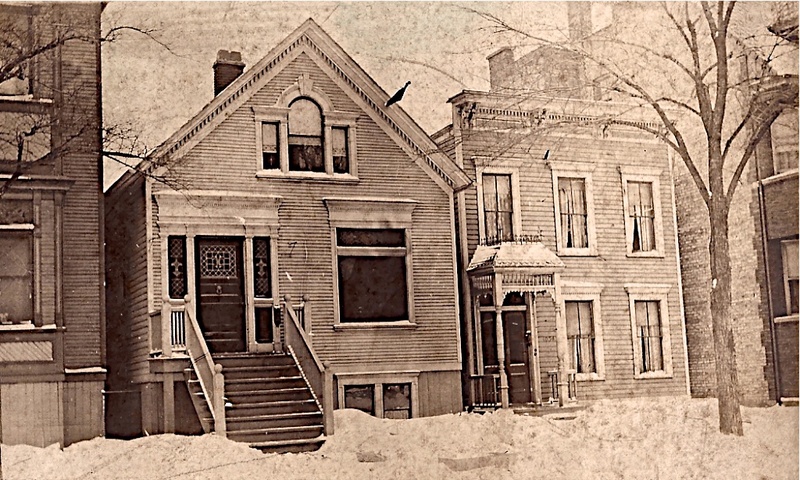 Grandson Paul says that when this picture was taken, probably in the mid-1920s, Bessie and her husband Jessie Kramer were living in the small hip-roofed house on the left (which we think has been added to over time and is today’s 3829 NE Failing). 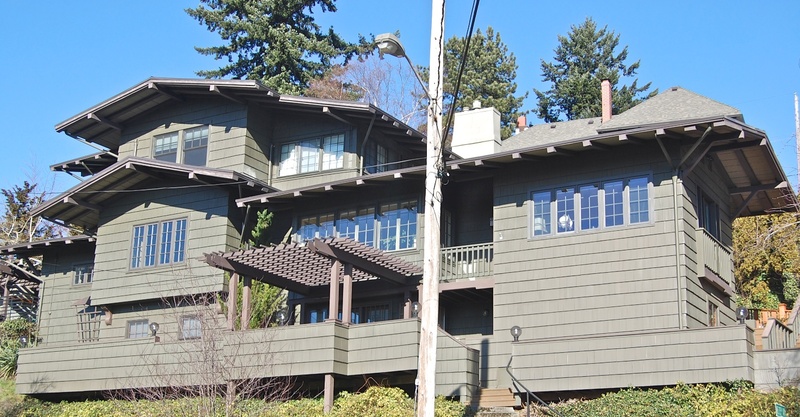 The house on the right, which has recently been on the market, is 3905 NE 40th, built in 1922. 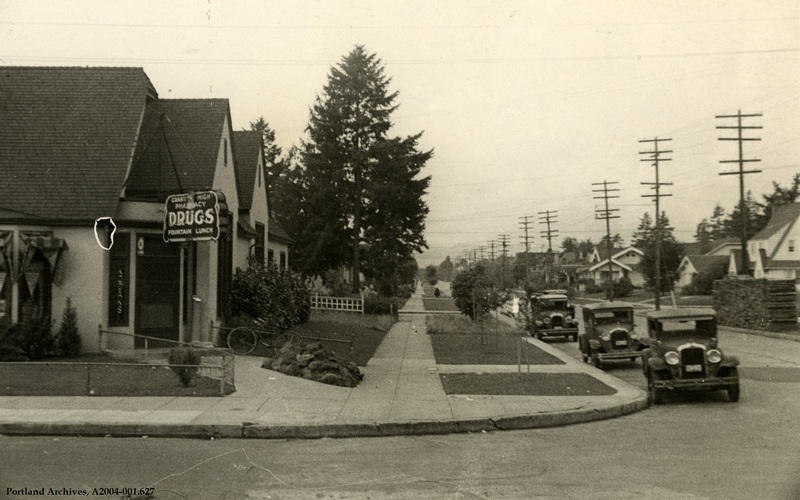 Stay tuned: some amazing pictures of Bessie’s Beaumont business at NE 43rd and Fremont are next, which will provide the basis for some good discussion about the early Beaumont business district. Remembering that during the last week of the year we are encouraging readers to share photos and memories of their favorite houses, wherever they may be. Son of Alameda, old-house fan and sometime AH correspondent Brian Rooney sends the following celebration of the Rooney family home on Dunkley. Thanks Brian! This photo-in-a-photo is nice example of how fond memories influence decisions. In 1965, when recent Portland arrivals Bill and Kathleen Rooney went looking for a house to raise their small but growing family. Their search was over as soon as they drove past 3215 Dunckley. 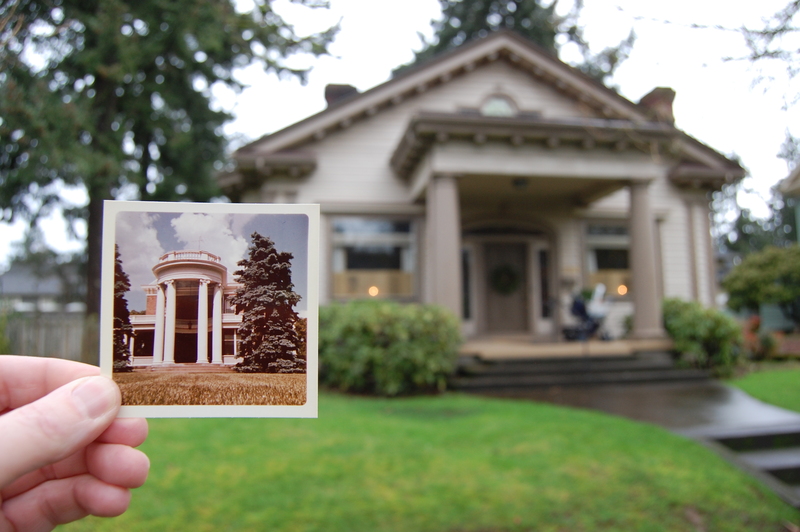 The portico on the Alameda house struck my mother’s heartstrings as it reminded her of the house she grew up in on the banks above the Mississippi River in Burlington, Iowa (seen inset here). The Iowa house was originally a square brick structure believed to have been built around 1850. 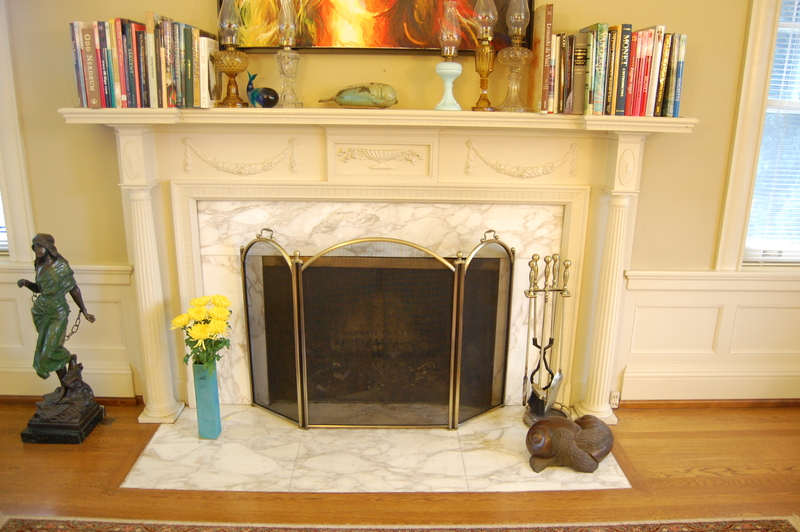 It was Kathleen Rooney’s grandfather who saw great potential, purchased the house and added the grand portico with pillars (and complimentary side porches) to the brick box transforming it into something special. The Dunckley house is also very special in that it is one of the last remaining double lot homes in the Alameda neighborhood. It was wonderful growing up with a large yard to play in, countless hours having been spent digging, swinging, climbing, sliding and getting muddy there. I dearly hope the house holds onto its own small park so that future families and children can continue to enjoy it forever. 3215 Dunckley is having two anniversaries in 2015: it’s 100th birthday and the 50thanniversary of the Rooney family having called it home. Let the celebrations begin! 1038 Diversey Parkway, Chicago, Illinois. About 1918. We always think of the last couple weeks here at the bottom of the year—with a little more time and space for reflection—as a good time to flip back through some of our favorite old photos and memories. 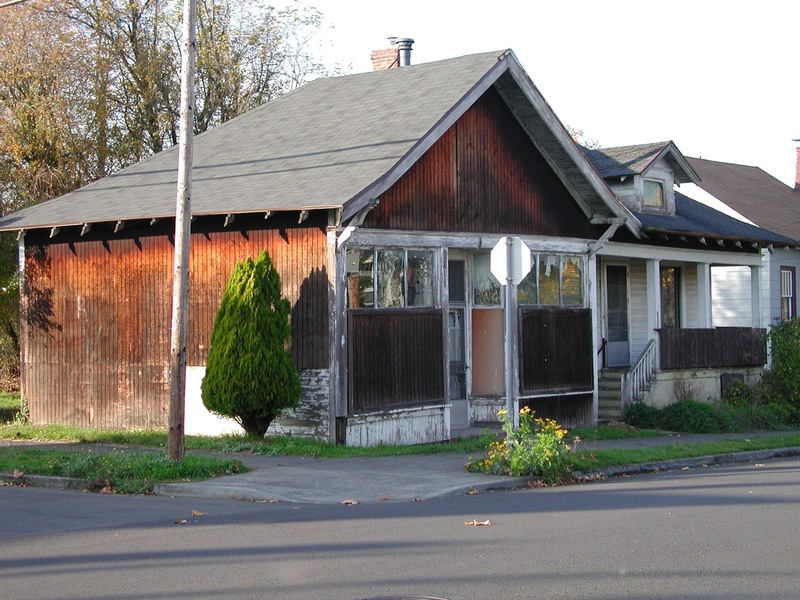 Since we are a blog dedicated (mostly) to old houses, we’d like to open it up for AH readers to share a favorite old house picture or story, from Northeast Portland or far beyond. Aunt Vivien and Dad, Diversey Parkway Steps, about 1918. 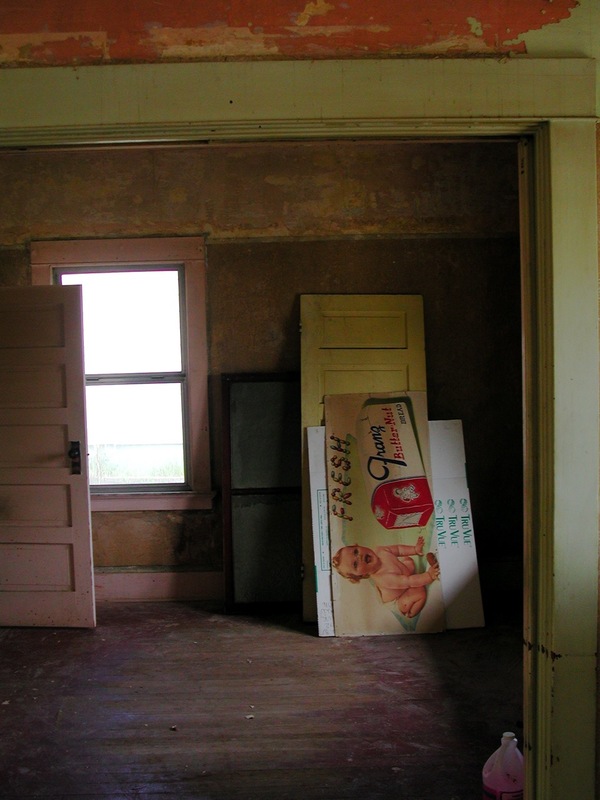 OK readers, this is your chance to share a picture or story of your favorite old house. Drop us a note. 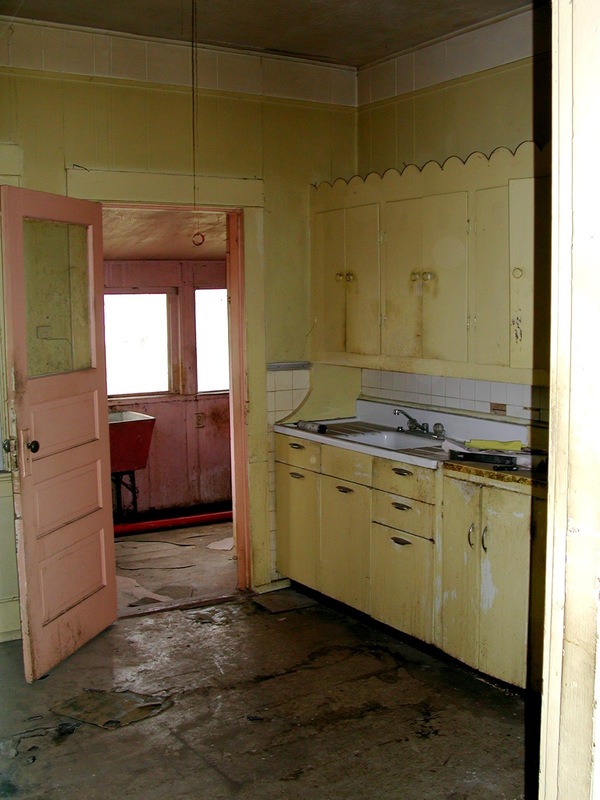 Time to appreciate old homes! 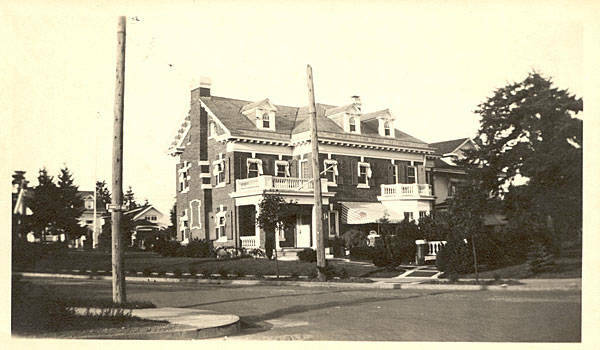 Here’s a photo of a house you’ll recognize at 3119 NE Alameda Street, built by Captain Delmer Shaver and his wife Nellie. Shaver spent his life (1867-1950) working with his father and brothers to create and operate the Shaver Transportation Company, which started out as a steamship company on the Columbia and Willamette rivers and has become a leading tugboat and barge company still on the waters today. 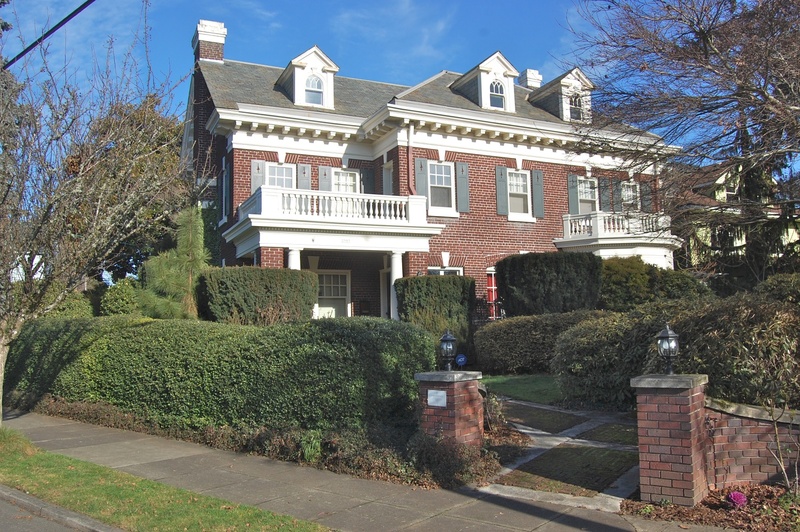 Delmer and Nellie had three children (James, Ellen and Doris) who grew up in this house, and attended Alameda School and Grant High School. 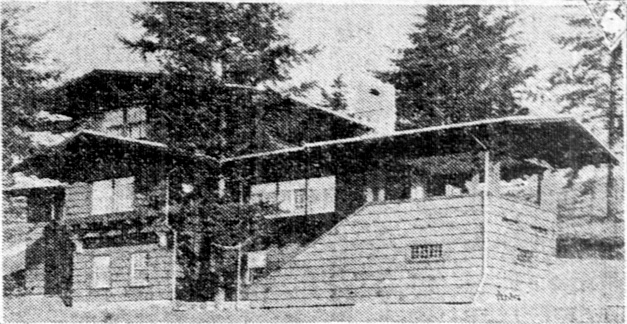 Not necessarily related to the house, but of note in the Shavers’ life in August 1914 was a gathering to mark their 25th wedding anniversary, held at the couple’s other home near Cannon Beach, which was poetically described in a brief article that appeared in the August 24th edition of The Oregonian. Captain and Mrs. Shaver celebrated their twenty-fifth wedding anniversary early this week at their country place. An elaborate dinner was served at tables arranged on the lawn. In the evening Japanese lanterns lighted the grounds and added dashes of color most effective among the deep green of the trees. The tables were decorated attractively. A bonfire followed the supper. Congratulations and good wishes were extended to the host and hostess. 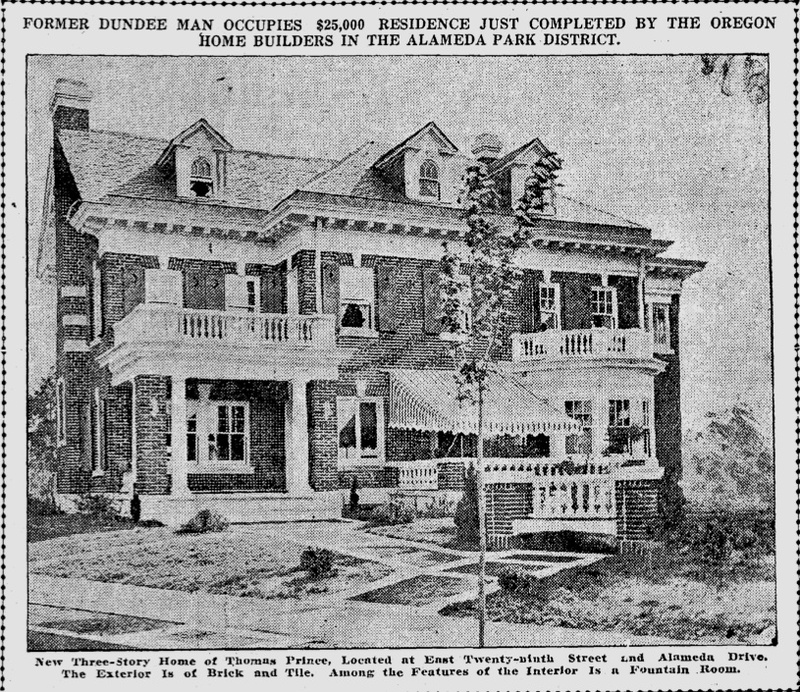 Once they moved in, the Shavers hosted similar gatherings at the Alameda home, some of which also made it onto the pages of The Oregonian, including soiree-like block parties that shut down The Alameda (as the street was known then) with lanterns hung across the road, music and other entertainments, and neighbors coming from throughout Portland to enjoy summer evenings. We think Captain Shaver would definitely recognize the house today, and would be pleased with its upkeep and the recent landscaping work that has been completed. 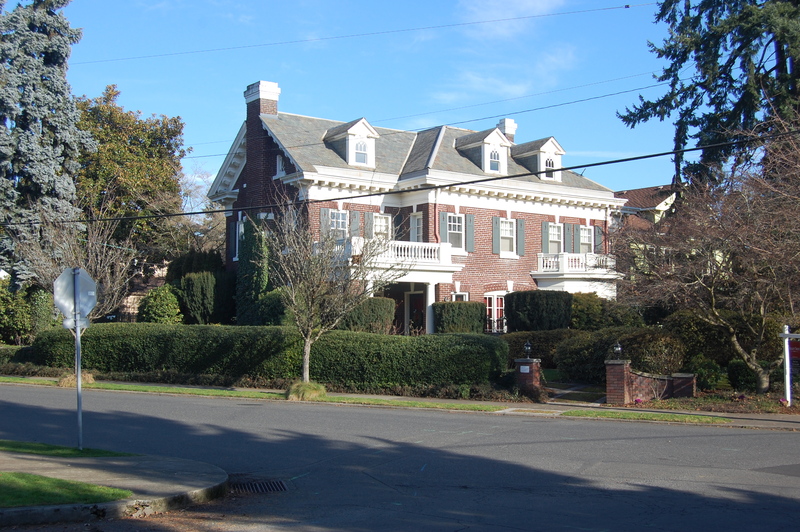 Here’s the Thomas Prince House, at 2903 NE Alameda Street, right at the top of Regents Hill. The then photo is from about 1922, taken by leaders of the Alameda Park Community Church who were out snapping several other photos of the neighborhood in those years, about the time the church was being built. The now view is from approximately the same location. 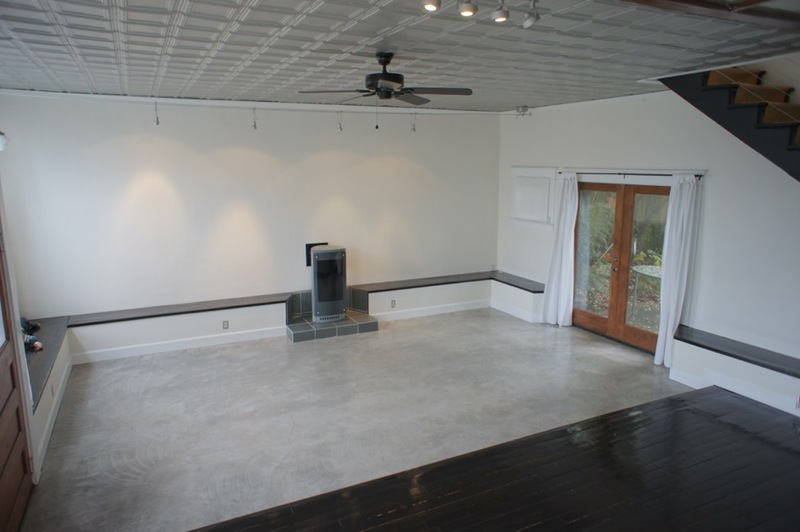 And, the house is for sale at $1.375 million. 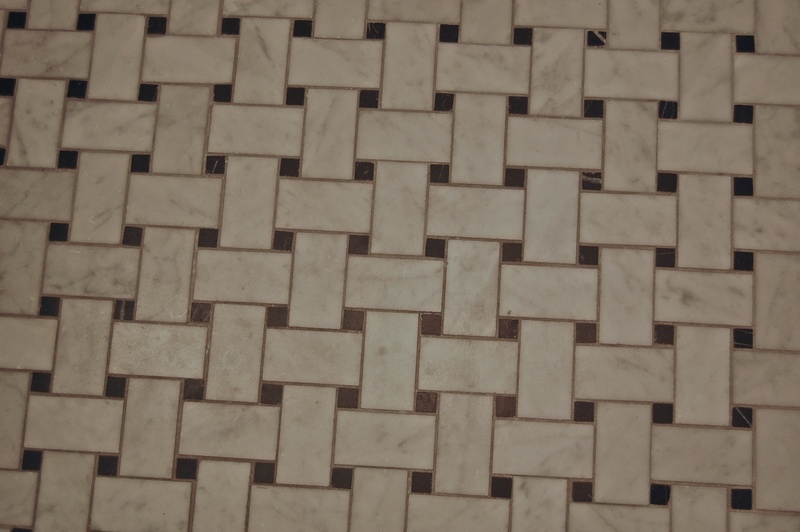 We visited the house recently and didn’t see any sign of the fountain room, though we did note the beautiful almost 3-D woven tile in the upstairs bathrooms; the marble fireplace (and a signature etched into the hearth); and the beautiful and stately birch paneled entryway. See the photos below by Emma Decker. 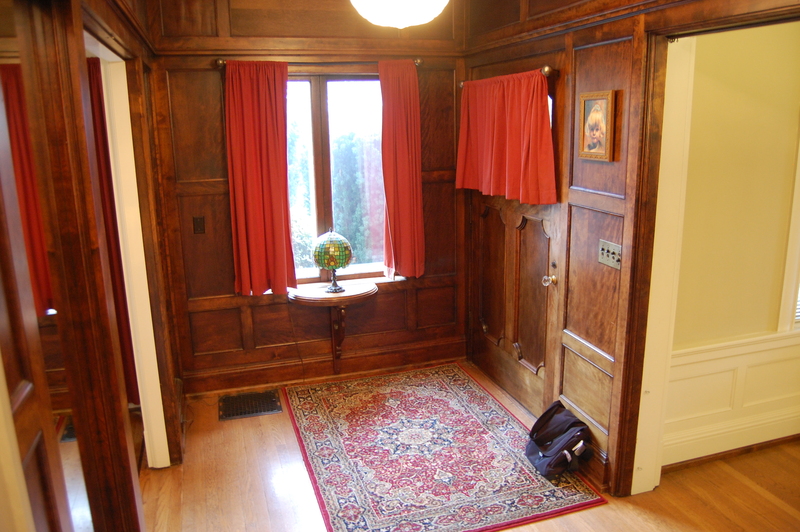 The house is worthy of its national register status (Here is a link to the nomination form filed in 1985 Thomas Prince House HNR Nomination complete with floor-by-floor drawings and descriptions). 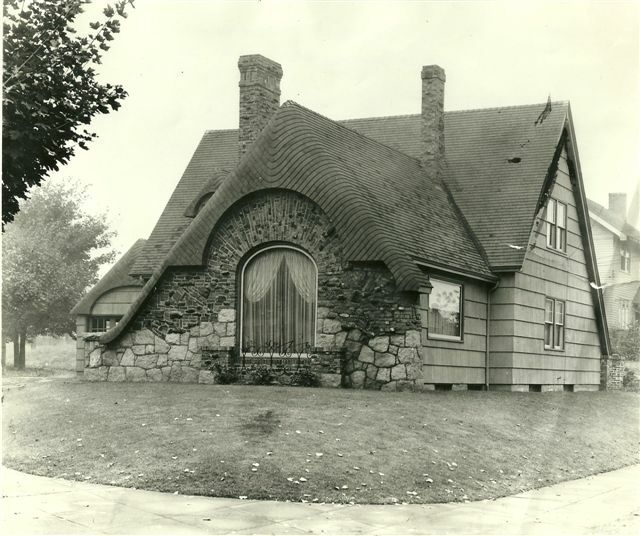 Prince was an interesting person with at least two major careers behind him when at age 71 in 1912 he agreed to be the financial backer for Oliver K. Jeffrey and the Oregon Home Builders Inc. Jeffrey and his company built more than two dozen homes in Alameda and Olmsted Park—many of them unique, grand and built for wealthy clients—and as regular readers of the blog will recall, also built the building that now houses Gordon’s Fireplace Shop at NE 33rd and Broadway (check out the story if you haven’t read it. We know you’ve driven by this place and wondered what it’s all about). 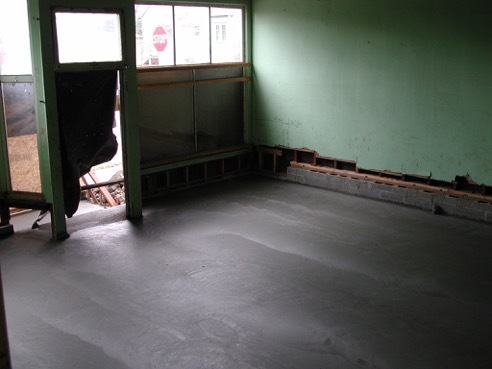 More soon about the Oregon Home Builders, a fascinating story that ends in a broken business model and bankruptcy. Prince’s roots were in Massachusetts, where he was a founding partner in Reed and Prince, a manufacturer of nuts and bolts with national market share (still in operation today). Something happened in the Prince family in the 1890s, and Thomas, accompanied only by his developmentally disabled son Harold Thomas Prince, left on their own for Oregon, where the elder became a walnut and fruit grower near Dundee. When he died in February 1920 at age 79, Prince owned and operated the largest walnut orchard in Oregon. Though it’s known today on the National Register of Historic Places as the Thomas Prince House, the elder Thomas didn’t spend much time here. He died in California in 1920 and his death set off a feeding frenzy among heirs and beneficiaries as his $2 million estate was divided up. A sad series of stories in The Oregonian in the three years after his death documents the infighting and finger pointing (as well as the occasional sale of property like Prince’s seven-passenger Pierce Arrow touring car sold at auction in 1920). Son Harold Thomas Prince lived in the house with his wife Marjorie until the 1950s. In the course of research over the years, we’ve come across quite a few pictures of neighborhood homes, which we’ve always squirreled away into the archive for some future use. Many of them are grainy, some are half-toned from old newspapers. Some have coffee spilled on them. Each one tells a story, particularly when paired with a contemporary photo of the same view. With the start of the new year, we’re inaugurating a regular feature that we call “Alameda Then and Now” to plumb the archive a bit and explore how time has changed the face of the neighborhood (or not, in some cases). The rule is that the then picture has to be before 1962, and the earlier the better. We’ll be pulling from our archive and will do our best to stay within the footprint of the Alameda Park plat. If you have images we should consider, please pass them along. We’ve created a category here on the blog, and a menu button on the top right which you can use to check back on the growing collection. Like a family’s picture album, the faces of our homes contain precious tales of our life and times. This pair is a little eerie, like the family just stepped out of the frame. 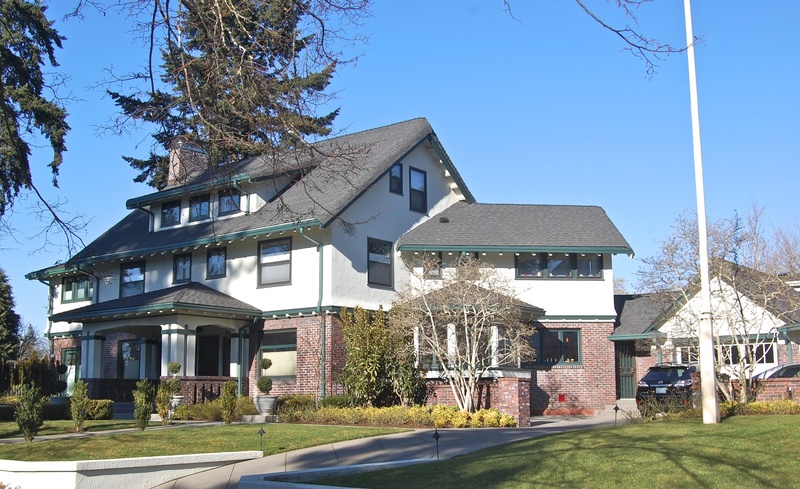 The house, located on NE 30th Avenue, is substantially the same as when it was built in 1912. 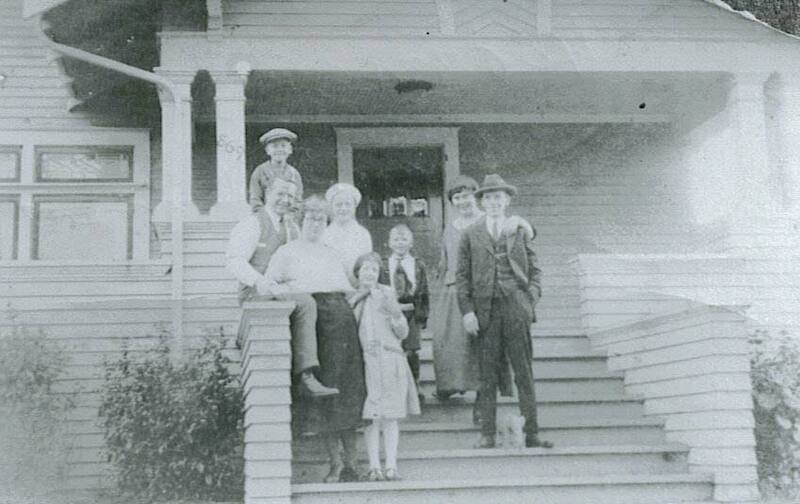 In the top photo, the Morrison family gathers on their front porch, about 1920. Below, the same view today. 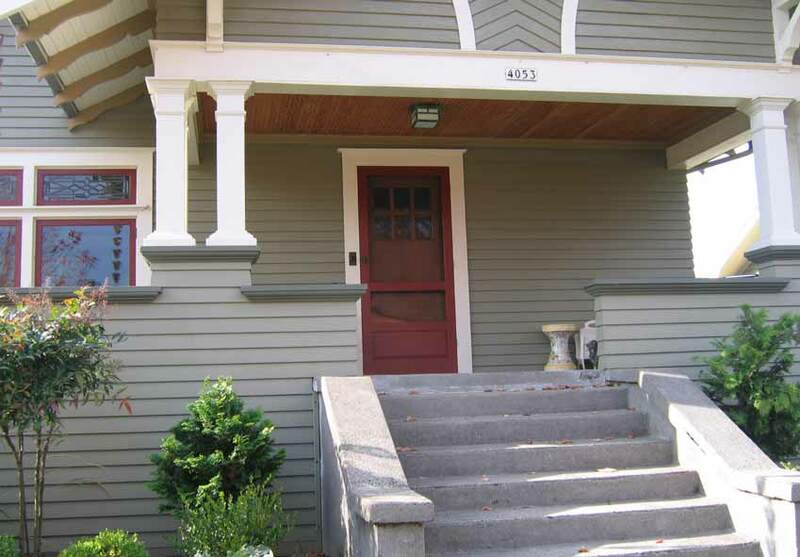 The wooden steps are long gone and the columns and porch walls have been restored, but the decorative rafter tails, door, windows and siding are the same this family knew almost 100 years ago. Click on each image for a larger view.